Last week, SPES was lucky to have the help of a group of 10 youth volunteers to help accomplish priority restoration projects in Stanley Park. The group was involved with restoration projects including maintaining the native plant nursery, carefully collecting native seeds from the Park, and removing invasive species. All along the way they had the opportunity to learn about the different native and invasive plants found locally and they were able to witness first-hand the impacts that humans can have on our environment. 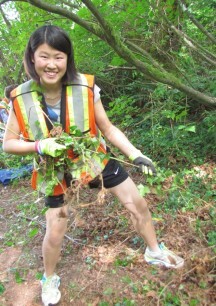 Thanks to all participants for helping to conserve biodiversity in Stanley Park!